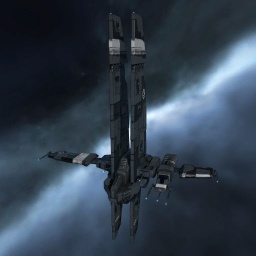 The Heron is the Caldari Exploration Frigate. Like all Tech I exploration frigates, the Heron receives skill-dependent bonuses to scanner probe strength. The Heron excels at probing cosmic signatures in all security levels of space. The Heron also receives a role bonus (independent of pilot skill level) to relic and data analyzer virus strength, which helps the Heron pilot crack exploration sites. With these two bonuses, the Heron is a strong starter frigate for Caldari pilots interested in Exploration. And while Heron pilots eventually skill into Tech II Covert Ops exploration ships (like the Buzzard), there isn’t much exploration content that the Heron can’t complete. The exploration Heron is also commonly fitted with a Prototype or Improved Cloaking Device, so that the ship can cloak while probing signatures in unsafe space. The Heron cannot, however, fit a Covert Ops Cloaking Device. So, when cloaked, it cannot warp and suffers a significant penalty to speed. Tech I exploration frigates have the largest cargo capacity of any frigate. This makes the Heron a speedy freight courier and distribution mission runner. By fitting the ship with expanded cargohold modules and cargohold optimization rigs, it is possible to build a Heron that can carry nearly 1000 m3 of cargo. Or, by exchanging the cargo modules for warp stabs, the Heron can serve as a low-sec courier that can evade insta-pointing gate camps. The Heron can be fit for combat probing, by using an Expanded Probe Launcher in place of the standard Core Probe Launcher. However, combat probing requires considerably greater in-game and pilot skill than site probing. Successful combat probers need to be able to locate targets in a single quick scan, or at most two. Pilots that have the Astrometrics skill levels required to do this, and have the experience necessary to use D-Scan intelligence to pinpoint those targets before scanning, are typically already trained into Covert Ops frigates anyway. While it is possible to explore with very minimal skills, having at least Astrometrics III, Astrometric Rangefinding II, Archaeology II, and Hacking II will make exploring much more enjoyable. Power Grid Management III and Jury Rigging I will help with getting a basic functional fit. The author does not recommend a serious attempt at exploration without these minimum skills. Also keep in mind that training the racial frigate skill will significantly improve your probe scanning strength. This is more a bait fir because due to relatively low DPS you won't be able to kill much. Yet, nobody would expect Heron to fight back so you can get few good fights from that. While not designed for combat, one can still combat fit an exploration frigate to catch unsuspecting solo gankers off guard. When fitting for combat, as with other races' exploration frigates the Heron has a severe shortage of power grid while having a huge CPU reservoir. In addition, the ship has no bonus to any specific weapon type, so it is generally best to fit missile or rockets to save on power grid for prop mods and a repper. The large CPU left over can then be used to fit a range of damage, resist or EWAR mods. New exploration Heron pilots should read the UniWiki guides to Exploration and Bookmarks, as well as attend Bookmarking 101 and Exploration 101 practicals, to learn tips and tricks from veteran explorers. This page was last modified on 23 March 2019, at 16:18. This page has been accessed 278,411 times.